Keywords: maggot therapy; acute burn; infection. The beneficial effects of maggots on wounds have been observed since ancient times and have an established role in necrotic or difficult to heal chronic wounds. Maggot therapy can accelerate debridement of sloughy and necrotic wounds and reduce the bacterial load of the wound, leading to earlier healing, reduced wound odour and less pain. Although maggots can be used successfully in a wide variety of wounds, they remain underutilised. 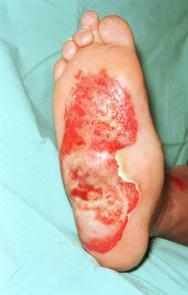 Maggot therapy has an established role in the management of necrotic or chronic wounds, but its use in acute burns has received scant attention in the literature. In this case report, we present a challenging case in which maggots were used to good effect in a burn that was difficult to manage by conventional means. The beneficial effects of maggots on wounds have been observed since ancient times, with reports of their success by Maya Indians and aboriginal tribes . Observations of favourable outcomes following maggot colonisation of battle wounds ,  have highlighted the ability of maggots to eliminate necrotic tissue whilst sparing living tissue. Zacharius is the first on record to have intentionally introduced maggots to wounds during the American Civil War in the nineteenth century , . More recently, during the First World War, Baer recognised their efficacy in infection, later using maggots in peace time to achieve a success rate of 90% in the treatment of chronic osteomyelitis . The advent of antibiotics during the 1940s heralded the demise of maggot therapy and this has remained the case until recently. The emergence of multi-resistant bacterial strains has brought about renewed interest in their use in certain wounds, particularly heavily contaminated/non-healing chronic wounds, or in patients unfit for anaesthesia. Therapeutic maggots used most commonly today are those of the greenbottle fly (Lucilia sericata), a facultative parasite that, in humans, only attacks necrotic tissue. The maggots hatch from eggs laid by mature adult flies. These initial maggots (first instars) grow from 1-2mm to 8-10mm, moulting twice to become third instars some five days later. They then pupate in a dry location and undergo metamorphosis to adult flies after a further week. They can only be used in wound debridement during the maggot stages, when they are incapable of reproduction; metamorphosis to adult flies only occurs outside the recommended time limits for their clinical application. A 61 year-old man sustained a 1% predominantly full-thickness burn to the sole of his right foot (Figure 1) following direct contact with a microwaved 'wheat-filled' heat bag. He had been using this to ease a long-term aching pain in his foot. He was referred to the department two days following injury. Initial treatment included chlorhexidine paraffin gauze (Bactigras) dressing and oral antibiotics (Augmentin). The patient had type 1 insulin-dependent diabetes with a history of poor blood glucose control. He had well-established, bilateral 'stocking distribution' sensory neuropathy (reduced sensation) and a 'rockerbottom' Charcot foot on the affected right side, as evidenced by plain radiology (Figure 2). Initial treatment included leg elevation and application of topical silver sulphadiazine (Flamazine) to soften the eschar. In view of the patient's poor state of health and anticipated difficulties with skin grafting or flap reconstruction of the insensate, deformed foot, it was decided to commence maggot therapy four days post injury. For maggots to function optimally they require a moist environment; saline soaks were therefore applied for 48 hours to moisten the wound and remove excess silver sulphadiazine prior to application of maggots. Three batches of LarvE were applied to the burn, each remaining in-situ for three days. At the end of maggot therapy (day 16), the anterior portion of the wound was found to be healing well with a virtual absence of slough (Figure 3). It was more difficult to maintain viable maggots over the posterior, more prominent part of the burn, due to the patient's lack of compliance with non-weightbearing. The patient underwent surgical debridement and split skin grafting to this area, although this was considerably smaller than initially anticipated. The patient was discharged home seven days postoperatively, with an estimated 70% graft take. Follow-up demonstrated healing of the anterior LarvE treated ulcer, but slower progress in the grafted area requiring prolonged conservative treatment. An appropriate wound environment is critical for healing; this needs to be moist and have an adequate supply of blood and oxygen. These conditions are enhanced by local debridement, wound hygiene and appropriate dressings (hydrogels, silver sulphadiazine). Maggots constitute a living biological dressing, which acts in a number of ways. Maggot secretions appear to amplify the healing effects of host epidermal growth factor and IL-6 in addition to their haemostatic properties . Secretions include allantoin and urea (antimicrobial activity) , , calcium carbonate (stimulation of phagocytosis) , and proteolytic enzymes (slough/necrotic tissue breakdown) . The resultant enzymatic degradation products are subsequently ingested and digested by the maggots. In vitro studies have shown maggots to inhibit and destroy a wide range of pathogenic bacteria including Staphylococcus aureus (including MRSA), group A and B streptococci, Gram positive, aerobic and anaerobic strains , , . Micromassage of the wound by maggot movement is thought to stimulate the formation of granulation tissue and wound exudate by the host . The net effects of maggot therapy are accelerated debridement of slough and necrosis and a reduction in the bacterial load of the wound, leading to earlier healing, reduced wound odour and less pain. wounds in body cavities or in close proximity to large vessels. There is now evidence to suggest that maggots can be used successfully in a wide variety of wounds (trauma, vascular, infected, malignant and a single report in an infected burn wound ). Despite this they remain underutilised. This may, in part, be due to a reluctance of staff, and to a lesser extent patients, to use them because of a misguided perception that maggots are dirty or carry disease. This case would appear to challenge the view that maggots are a treatment of last resort only for the chronic wound unresponsive to other therapies. From our experience, it is recommended that maggot therapy be considered in the management of acute burns. 1. Church JC. The traditional use of maggots in wound healing and the development of larval therapy (biosurgery) in modern medicine. J Altern Complement Med 1996; 2(4): 525-27. 2. Namias N, Varela JE, Varas RP, Quintana O, Ward CG. 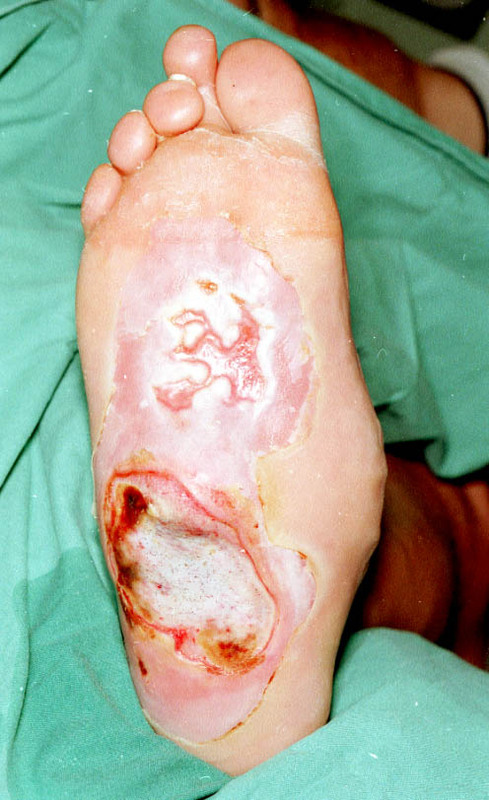 A case report of maggot therapy for limb salvage after fourth-degree burns. J Burn Care Rehab 2000; 21(3): 254-57. 3. Thomas S, Jones M, Shutler S, Andrews A. All you need to know about maggots. Nursing Times 1996; 92(46): 63-76. 4. Prete PE. Growth effects of Phaenicia sericata larval extracts on fibroblasts: mechanism for wound healing by maggot therapy. Life Sci 1997; 60(8): 505-10. 5. Schmidt RJ, Chung LY, Andrews AM, Spyratou O, Turner T. Biocompatibility of wound management products. J Pharmacy Pharmacol 1993; 45: 508-13. 6. Sherman RA, Hall MJ, Thomas S. Medicinal maggots: an ancient remedy for some contemporary afflictions. Annual Review of Entomology 2000; 45: 55-81.